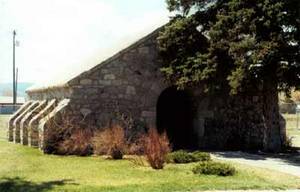 This impressive Gothic-arched stone entrance to the Forestvale Cemetery was constructed in 1890, with the first burial in September 1890 and by June 2002, there were 14,271 burials recorded in Forestvale. 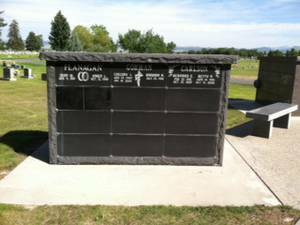 The cemetery is located near Helena, Lewis & Clark County, Montana about two and a half miles north of the city limits. The Cemetery consists of 148 acres with about 40 acres currently developed. It has been placed on the National Register of Historic Places. Helena civil engineer Harry Wheeler designed Forestvale incorporating the notion of the cemetery as a “rural park” into his design. 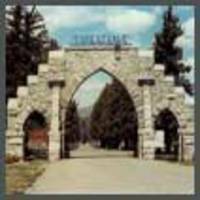 Mature trees, well-planned landscaping, tree-lined paths, beautiful monuments, a mausoleum, columbariums, and arbor gardens grace this beautiful cemetery in the heart of Montana. Plantings of native trees shade the gravesites and line the meandering roads and walkways that wind through the grounds while the overall landscaping provides an atmosphere of tranquility and solemn reflection. The Receiving Vault is located just inside the cemetery grounds. It functioned as storage for bodies in caskets during the winter months until the ground thawed and allowed for burial. It is not necessary to use this vault today. 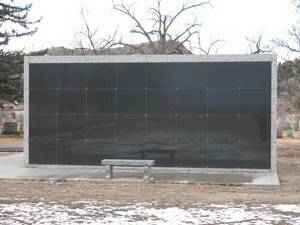 The Columbarium has above ground ash burial spaces. The Mausoleum has above ground full burial spaces.